The Royal Challengers of Bangalore were facing the Knights from Kolkata in the 33rd match of this edition of the Indian Premier League. Both the teams were equally dangerous and one could not predict a favorite coming into the game. 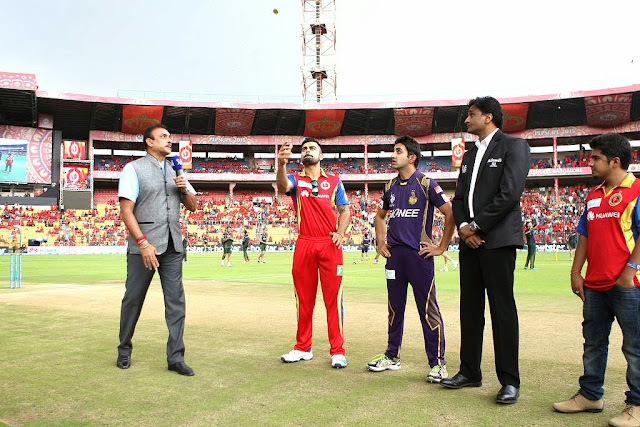 Royal Challengers Bangalore won the toss and elected to bowl first at the M.Chinnaswamy Stadium, Bengaluru. But wait! The match did not start after that! A rain delay of nearly three hours meant the game was reduced to 10 overs a side Clearly, the rain gods do not favour the royal challengers. When the game finally started, the duo of Gambhir and Uthappa came out to open the innings for Kolkata. Both of them got off to a steady start. Just then, a sharp catch by Mandeep Singh off David Wiese, ended Gambhir’s stay in the middle. Andre Russell, the hard-hitting all-rounder was promoted to no.3 as they did not have time to settle and needed to keep the runs ticking. He did not disappoint on the day as he started smashing the ball right from the word “GO”.He displayed a flurry of hits all over the park and entertained the crowd thoroughly. Robin Uthhappa was playing steadly. But he later got out the the young leggie, Yuzvendra Chahal. On the back of a good cameo of 45(17) by Andre Russell, Kolkata reached 111/4 after 20 overs. Mitchell Starc, the left-arm quick bowled a good last over to restrict them. Chasing the total, RCB got off to a very good start all thanks to the pair of Chris Gayle and Virat Kohli. The former fell to left-arm chinaman bowler Brad Hogg with 48 on the board after 3.5 overs. AB de Villiers, the batting sensation came in. But it wasn’t his day. His stay at the crease was very brief as Piyush Chawla the leg-spinner sent him packing with a ripper. Now, there was a slight twist in the tale! Just after that, RCB lost way in the chase when Virat Kohli was holed out in the deep for 34 off the bowling of Russell. 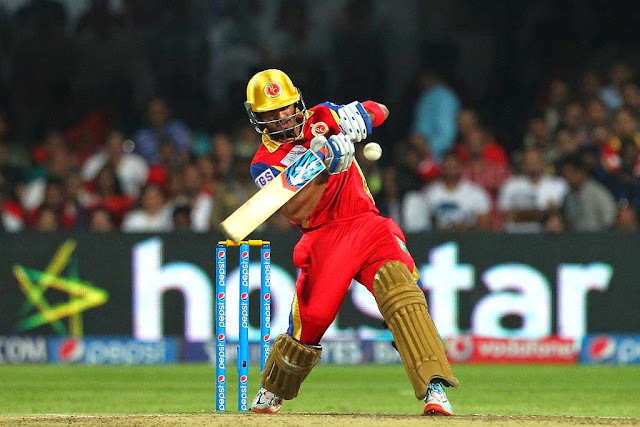 However, Mandeep Singh's cameo 45 off 18 balls helped RCB register their first win at home in IPL 2015. He smashed 7 boundaries including 3 big sixes.It can be said that 111 wasn't enough for Kolkata on the occasion. Man of the Match: Mandeep Singh was declared the Man of the Match for his match-winning knock. That was the story from the game! Stay tuned for more! Until then, take care folks!